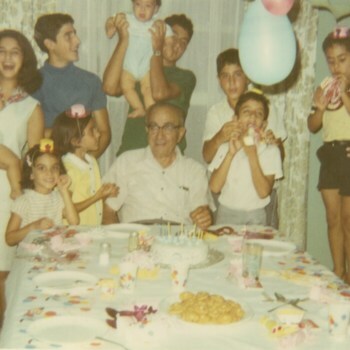 The El-Khouri family enjoy themselves at a home gathering (Folder 2-4). A photograph of a group of children surrounding a sitting elderly man. The individuals are identified only as members of the Raad family. A photograph of Moise Khayrallah and an unidentified friend at a party, playing the oud and the tablah together. Moise joined a group of students and professors who formed a band together in 1984. A photograph of Moise and Vera Khayrallah (center) with six other unidentified people. The group is wearing party hats and favors; in the foreground there is a coffee table laid with food.